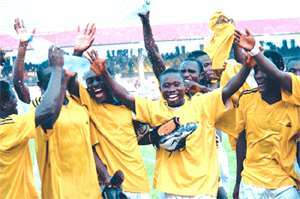 Accra, Dec. 20, Graphic -- Okwawu United secured their place in next year's premiership after beating Sekondi Hasaacas 1-0 in a play-off at the Ohene Djan Stadium in Accra yesterday. Okwawu struck through Thomas Avorgbedor after just 11 minutes from the penalty spot after Hasaacas' Eric Owusu pulled down Gani Nasiru in the penalty box. Okwawu from them on took control of the game but failed to consolidate the advantage in spite of their persistence for a more secure lead.They, therefore, held on to the slim lead for the rest of the afternoon, which meant a nervous ending for them as Hasaacas staged a late fight back. But the effort, like it happened all through the match, failed to offer Hasaacas redemption from defeat. Okwawu built their attacks in a cohesive relationship from defence to attack and made nonsense of Hasaacas' offside trap with a passing game developed from the flanks under the influence of midfielder Mohammed Polo.In one such move, Gani capitalised on Eric Owusu's faulty challenge and went past the defender who pulled him down as he entered the penalty area. Okwawu sustained their control and created a few scoring chances but failed to find target.Hasaacas returned from the recess full of fight and had the game under their control in a manner that sharply contrasted the first half procedings. On three occasions, however, they missed agonisingly, while Isaac Anderson's 67th minute grazed the bar with a shot from the penalty area, which meant they left the field with their hopes for premiership football next year only hinging on the outcome of another play-off against a Division One side.